The sacral percutaneous fixation has many advantages but can be associated with a significant exposure to X-ray radiation. Currently, sacroiliac screw fixation represents the only minimally invasive technique to stabilize the posterior pelvic ring. It is a technique that should be used by experienced surgeons. We present a practical review of important aspects of this technique. The aim of this work is, through a nonexhaustive review of the literature expose current considerations about SIS fixation technique. This technique obtains fixation by traversing bilateral sacroiliac joints and the sacral body, this technique can solve the problem of bilateral sacroiliac joint fractures and dislocations. , In the past were commonly used two techniques, the oblique method of SIS placement, in which the screw is obliquely aligned, directed inferiorly to superiorly and posteriorly to anteriorly, and the transverse alignment of the SIS through the sacral ala on both the inlet and outlet views of the sacrum. With the first technique was an increased the risk of unrecognized anterior protrusion of screws beyond the sacral body, and with the second-technique results in a smaller secured area of the sacral isthmus bone. The current procedure technique is the SIS under fluoroscopic observation with the standard Matta projections anterior-posterior (a.p. ), inlet, outlet [Figure 1] and [Figure 2]. The screws are placed through the outer table of the ilium, through the S1 joint and into the lateral sacrum. This bone channel has been well-described and regularly used in pelvic trauma applications for screw placement. It has also been performed with an open and percutaneous technique. With the development of adjunctive devices for Cotrel-Dubosset instrumentation, a monoblock was developed to use this trajectory for screw fixation. Recently, Pan et al. have introduced a SIS fixation guide and evaluated its efficacy in fixation of sacroiliac joint fracture-dislocations, they found that the minimally invasive guide can eliminate discrepancies resulting from the surgeon's own sensory input when inserting screws under the guidance of computed tomography (CT), making percutaneous iliosacral screw fixation more accurate, safe and simple. The use of a guide can curtail the surgical time to about 14 min. As previously mentioned, is widely used the fluoroscopy control for the placement of the screws. This leads the technique being highly dependent on fluoroscopic technician, and on the operator's ability not only to interpret the fluoroscopic images but also to control wire placement based on this interpretation. Using the conventional fluoroscopy-based technique, the drilling can only be controlled in one projection at once; thus, the position of the screws must be followed and adjusted under fluoroscopy in a.p., inlet, outlet and lateral projections. All this result in increased radiation exposure for the patient and the surgeon. Have been reported injuries to nerve roots and the gluteal vessels in up to 3-15% of cases using this method. The rotational stability of the lengthened SIS or SIS fixation in S1 is superior to that of S2. Sacroiliac screw fixation is a commonly used procedure for iliosacral joint fracture-dislocations and sacral fractures. Currently, the standard technique is the percutaneous iliosacral screw fixation under conventional C-arm fluoroscopy that often exposes the patient to prolonged radiation. Unfortunately, even experienced surgeons can have a high rate of screw malposition and nerve and vessel injuries, being that the reason because SIS fixation should be performed under better technology control, but in the ER setting, this could be laborious and can finish in a loss of time for the patient treatment. 1. Acharya NK, Bijukachhe B, Kumar RJ, Menon VK. Ilio-lumbar fixation - the Amrita technique. J Spinal Disord Tech 2008;21:493-9. 2. Bale RJ, Kovacs P, Dolati B, Hinterleithner C, Rosenberger RE. Stereotactic CT-guided percutaneous stabilization of posterior pelvic ring fractures: A preclinical cadaver study. J Vasc Interv Radiol 2008;19:1093-8. 3. Beaulé PE, Antoniades J, Matta JM. Trans-sacral fixation for failed posterior fixation of the pelvic ring. Arch Orthop Trauma Surg 2006;126:49-52. 4. van den Bosch EW, van Zwienen CM, van Vugt AB. 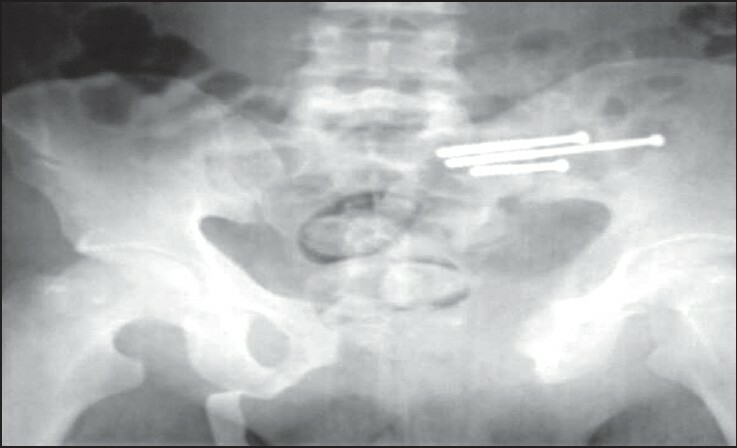 Fluoroscopic positioning of sacroiliac screws in 88 patients. J Trauma 2002;53:44-8. 5. Citak M, Hüfner T, Geerling J, Kfuri M Jr, Gänsslen A, Look V, et al. Navigated percutaneous pelvic sacroiliac screw fixation: Experimental comparison of accuracy between fluoroscopy and Iso-C3D navigation. Comput Aided Surg 2006;11:209-13. 6. Dawei T, Na L, Jun L, Wei J, Lin C. A novel fixation system for sacroiliac dislocation fracture: Internal fixation system design and biomechanics analysis. Clin Biomech (Bristol, Avon) 2013;28:129-33. 7. Dickey ID, Hugate RR Jr, Fuchs B, Yaszemski MJ, Sim FH. Reconstruction after total sacrectomy: Early experience with a new surgical technique. Clin Orthop Relat Res 2005;438:42-50. 8. Frank M, Dedek T. Percutaneous iliosacral screw placement using a radiolucent drive. Acta Orthop Belg 2012;78:519-22. 9. Fujibayashi S, Neo M, Nakamura T. Palliative dual iliac screw fixation for lumbosacral metastasis. Technical note. J Neurosurg Spine 2007;7:99-102. 10. Gardner MJ, Routt ML Jr. Transiliac-transsacral screws for posterior pelvic stabilization. J Orthop Trauma 2011;25:378-84. 11. Giannoudis PV, Papadokostakis G, Alpantaki K, Kontakis G, Chalidis B. Is the lateral sacral fluoroscopic view essential for accurate percutaneous sacroiliac screw insertion? An experimental study. Injury 2008;39:875-80. 12. Gänsslen A, Hüfner T, Krettek C. Percutaneous iliosacral screw fixation of unstable pelvic injuries by conventional fluoroscopy. Oper Orthop Traumatol 2006;18:225-44. 13. Hilgert RE, Finn J, Egbers HJ. Technique for percutaneous iliosacral screw insertion with conventional C-arm radiography. Unfallchirurg 2005;108:954, 956-60. 14. Iguchi T, Ogawa K, Doi T, Miyasho K, Munetomo K, Hiraki T, et al. Computed tomography fluoroscopy-guided placement of iliosacral screws in patients with unstable posterior pelvic fractures. Skeletal Radiol 2010;39:701-5. 15. Ilharreborde B, Breitel D, Lenoir T, Mosnier T, Skalli W, Guigui P, et al. Pelvic ring fractures internal fixation: Iliosacral screws versus sacroiliac hinge fixation. Orthop Traumatol Surg Res 2009;95:563-7. 16. Konrad G, Zwingmann J, Kotter E, Südkamp N, Oberst M. Variability of the screw position after 3D-navigated sacroiliac screw fixation. Influence of the surgeon's experience with the navigation technique. Unfallchirurg 2010;113:29-35. 17. Kostuik JP. Spinopelvic fixation. Neurol India 2005;53:483-8. 18. Kraus MD, Krischak G, Keppler P, Gebhard FT, Schuetz UH. Can computer-assisted surgery reduce the effective dose for spinal fusion and sacroiliac screw insertion? Clin Orthop Relat Res 2010;468:2419-29. 19. Mendel T, Noser H, Wohlrab D, Stock K, Radetzki F. The lateral sacral triangle - A decision support for secure transverse sacroiliac screw insertion. Injury 2011;42:1164-70. 20. Mendel T, Radetzki F, Wohlrab D, Stock K, Hofmann GO, Noser H. CT-based 3-D visualisation of secure bone corridors and optimal trajectories for sacroiliac screws. Injury 2013;44:957-63. 21. Osterhoff G, Ossendorf C, Wanner GA, Simmen HP, Werner CM. Posterior screw fixation in rotationally unstable pelvic ring injuries. Injury 2011;42:992-6. 22. Pan WB, Liang JB, Wang B, Chen GF, Hong HX, Li QY, et al. The invention of an iliosacral screw fixation guide and its preliminary clinical application. Orthop Surg 2012;4:55-9. 23. Polly DW Jr, Latta LL. Spinopelvic fixation biomechanics. Semin Spine Surg 2004;16:101-6. 24. Riehl J, Widmaier J. A simulator model for sacroiliac screw placement. J Surg Educ 2012;69:282-5. 25. Routt ML Jr, Kregor PJ, Simonian PT, Mayo KA. Early results of percutaneous iliosacral screws placed with the patient in the supine position. J Orthop Trauma 1995;9:207-14. 26. Routt ML Jr, Simonian PT, Mills WJ. Iliosacral screw fixation: Early complications of the percutaneous technique. J Orthop Trauma 1997;11:584-9. 27. Sciulli RL, Daffner RH, Altman DT, Altman GT, Sewecke JJ. CT-guided iliosacral screw placement: Technique and clinical experience. AJR Am J Roentgenol 2007;188:W181-92. 28. Sun YQ, Citak M, Kendoff D, Gansslen A, Krettek C, Hufner T. Navigated percutaneous placement of iliosacral screws using intra-operative three-dimensional imaging. Zhonghua Yi Xue Za Zhi 2008;88:3226-9. 29. Tjardes T, Paffrath T, Baethis H, Shafizadeh S, Steinhausen E, Steinbuechel T, et al. Computer assisted percutaneous placement of augmented iliosacral screws: A reasonable alternative to sacroplasty. Spine (Phila Pa 1976) 2008;33:1497-500. 30. Tonetti J, Cazal C, Eid A, Badulescu A, Martinez T, Vouaillat H, et al. Neurological damage in pelvic injuries: A continuous prospective series of 50 pelvic injuries treated with an iliosacral lag screw. Rev Chir Orthop Reparatrice Appar Mot 2004;90:122-31. 31. Trumm CG, Rubenbauer B, Piltz S, Reiser MF, Hoffmann RT. Screw placement and osteoplasty under computed tomographic-fluoroscopic guidance in a case of advanced metastatic destruction of the iliosacral joint. Cardiovasc Intervent Radiol 2011;34 Suppl 2:S288-93. 32. 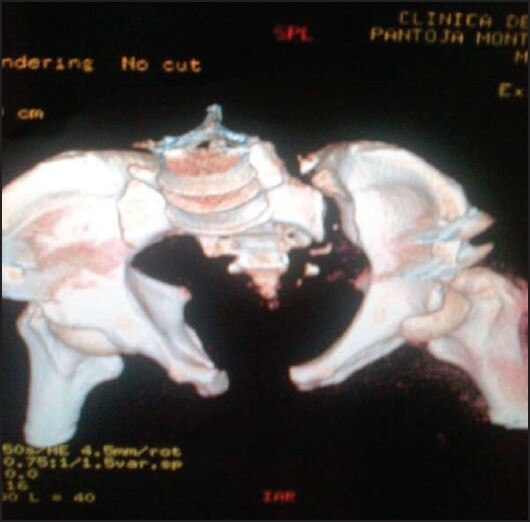 Vidal J, Allieu Y, Fassio B, Adrey J, Goalard C. Spondylolisthesis: Reduction with Harrington's rods. Rev Chir Orthop Reparatrice Appar Mot 1973;59:21-41. 33. Wang MY, Williams S, Mummaneni PV, Sherman JD. Minimally invasive percutaneous iliac screws: Initial 24 case experience with CT confirmation. J Spinal Disord Tech 2012. [Epub ahead of print]. 34. Yinger K, Scalise J, Olson SA, Bay BK, Finkemeier CG. Biomechanical comparison of posterior pelvic ring fixation. J Orthop Trauma 2003;17:481-7. 35. Yu BS, Zhuang XM, Zheng ZM, Li ZM, Wang TP, Lu WW. Biomechanical advantages of dual over single iliac screws in lumbo-iliac fixation construct. Eur Spine J 2010;19:1121-8. 36. Yu BS, Zhuang XM, Li ZM, Zheng ZM, Zhou ZY, Zou XN, et al. Biomechanical effects of the extent of sacrectomy on the stability of lumbo-iliac reconstruction using iliac screw techniques: What level of sacrectomy requires the bilateral dual iliac screw technique? Clin Biomech (Bristol, Avon) 2010;25:867-72. 37. Zhao Y, Li J, Wang D, Liu Y, Tan J, Zhang S. Comparison of stability of two kinds of sacro-iliac screws in the fixation of bilateral sacral fractures in a finite element model. Injury 2012;43:490-4. 38. van Zwienen CM, van den Bosch EW, Snijders CJ, Kleinrensink GJ, van Vugt AB. Biomechanical comparison of sacroiliac screw techniques for unstable pelvic ring fractures. J Orthop Trauma 2004;18:589-95.